Overview: A relaxing four day and three night exploration around Luang Prabang, the former Laotian capital and a UNESCO World Heritage City. Laos is "the land in between," surrounded by China, Vietnam, Cambodia, Thailand and Myanmar (Burma). 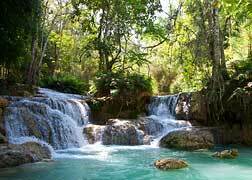 Sparsely populated and landlocked, Laos is a bit smaller than the United Kingdom and about half the size of Thailand. Elevations vary from 230 feet (lower Mekong Delta) to 9242 feet (Phu Bia in the upland Xieng Khouang Province). 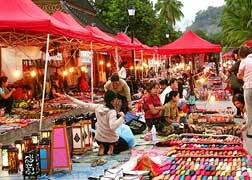 Luang Prabang (at 1000 feet) is considered as the most charming Southeast Asian city. 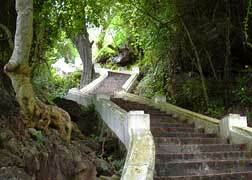 Situated at the confluence of two rivers nearly surrounding it, the town lies beneath a temple–capped hill. Luang Prabang holds both traditional Laotian wooden houses as well as European designs, cultural reminders of a time when Laos was part of the French Indochine colony. Golden–roofed Buddhist temples (Wats) are decorated with mosaics and murals of Buddha's life and are constructed with teak balconies and 19th century shuttered windows. Colorful Luang Prabang is set against a backdrop of verdant greenery and rugged mountains. Day 1: After arriving at Luang Prabang's airport, your guide awaits to greet you and bring you to your hotel. A half–day orientation of Luang Prabang illuminates this small town's history and culture. Quite striking are its Wats — spiritual centers of Laotian Buddhist culture. Opportunity could allow you to speak with monks or novices living at the temple to gain insight into the spiritual life of the Laotians. 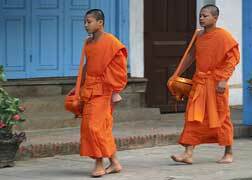 Day 2: For pre–dawn risers, enjoy a special visit to watch monks collecting their alms. Just as the sun rises, long lines of orange–robed monks leave their pagodas, walking barefoot down the streets collecting offerings from Luang Prabang's dwellers. It's a traditional and serene ceremony highlighting the spiritualism of the Laotians. Return to the hotel for breakfast. Soon after, your car and driver awaits to take you to Luang Prabang's historical Old Town. Take–in the Fresh Market, like a farmer's market back home. Accompanied by your guide, walk the rows of stalls with the locals who come here daily to shop for vegetables, fruits, specialties and delicacies. The market is adjacent to the National Museum, your next stop (closed Tuesdays). Once the Royal Palace of Laos, the National Museum is filled with art, artifacts, and jewels. Your visit examines the collected history and rich culture of the country. 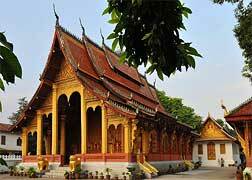 Continue exploring Luang Prabang by visiting some of the city's most important temples. Wat Visoun is where you will find the famous Watermelon Stupa, shaped like the fruit which bears its name. This temple was destroyed in 1887 by the invading Chinese Black Flags and was restored in 1930 by Buddhist monks and locals. 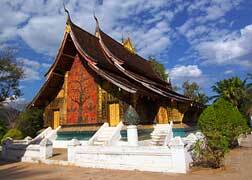 Also visit Wat Aham to see the altar of the two guardian spirits of Luang Prabang. 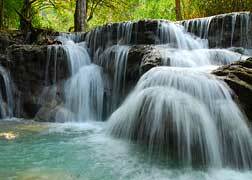 Now it's off to the refreshing waters of the Kuang Si Falls (sometimes spelled Kuang Xi), found 18 miles south of Luang Prabang. Water cascades down a multi–level limestone formation creating a series of turquoise pools, great for a swim on a hot day. The main fall is 200 feet high! The surrounding jungles and dense woods are filled with wildlife and pleasant walks are found along the natural footpaths. Returning to Luang Prabang, stop at Ban Tha Pan village to learn more about the Kamu lifestyle. Stop at Ban Ou, a Lao Loum (a majority ethnic group in Laos) village. Day 3: This morning's adventure is along Luang Prabang's peninsula to Wat Xieng Thong, situated where the Mekong and Nam Khan Rivers merge. The temple unveils it's golden gates, stunning ornaments and colorful murals. 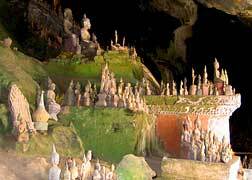 Walk to the nearby pier and board the elegant Nava Mekong for your scenic two hour cruise to the Pak Ou Caves. Travel Details: This itinerary is designed as a short independent trip or itinerary to enhance another Asia area program. There are flights to Lao Prabang from Bangkok, Chiang Mai, Hanoi, Vientieane, Hanoi or Siem Reap on your schedule. Details mentioned here are subject to change depending on availability. This guide is meant only as a general guide to the suggested daily events. The best time to visit for weather is between November and January however you can visit at other times of year and even the monsoon season has its own damp charm. Climate is tropical monsoonal with rain falling throughout May to October. February through April are the hottest months. Passport, Visa(s), Physicians Visit, Emergency Medical & Evacuation Insurance, International travel to/from Luang Prabang, Meals Beyond Above Itinerary, Beverages, Spending/Personal Money (usual requirements for our main trips, nothing extra is required for this addition). Mild: Comfortable accommodation in hotels and guest houses. Activities are usually mild and can include walks and long drives. Other options available per your interest.